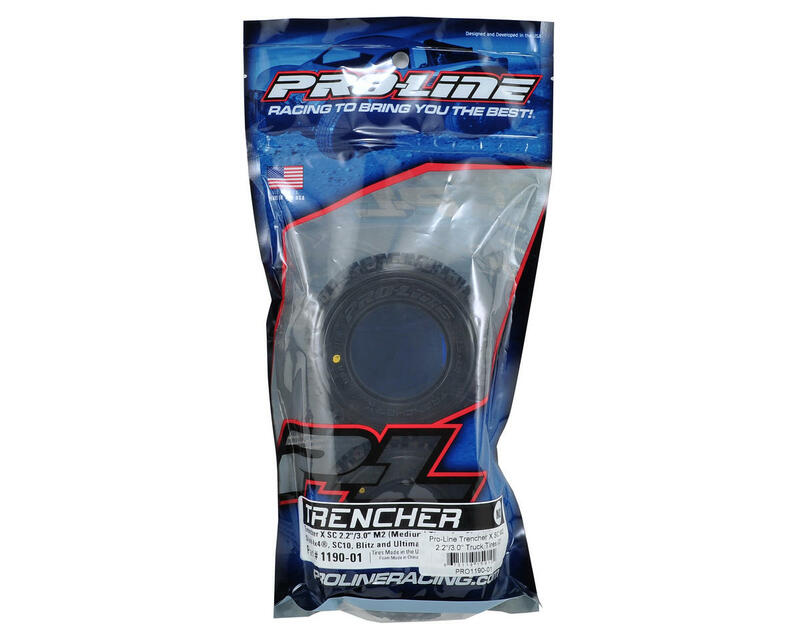 This is a set of two Pro-Line Trencher X SC 2.2/3.0" Short Course Truck Tires. The Trencher tires are designed to give your short course truck optimal traction on just about any surface. Realistic shaped treads give your short course truck a scale look while offering ridiculous amounts of forward bite. The tall tread will also offer traction in many different terrains and deliver durability that is second to none. The Trencher X improves on the original with extra width and even more stump pulling traction! THESE are the best overall tires for your SCT. I have tried many, many other options. These have good to great traction on EVERY surface I have tested, including concrete. They don't wear fast like other tires. I am putting tons of power through these (6.5T boosted motor) and they are handling the load perfectly. Save money and get these from the start! I will state again, best overall general-use tire for short course trucks, hands down. Hard packed, concrete, loose, loamy, gravel, grass, sand, you name it....they hook up. Installed on Blitz after removing worn stocks. Noticed grip better than new stock tires and sweet lookin roost. I've been running these on my Losi Ten-SCTE with the Hobbywing 4000kv 540 4-pole motor when I'm just bashing. Off road, these tires have great traction and are fairly predictable. Like others have said, use caution when purely using these for on-road, high traction surfaces. The tread blocks are tall and there's a lot of void between the blocks that will allow them to squirm around a lot leading to accelerated tire wear. I've got a decent amount of feathering on the leading edges of the blocks; tread depth is holding up well, though. 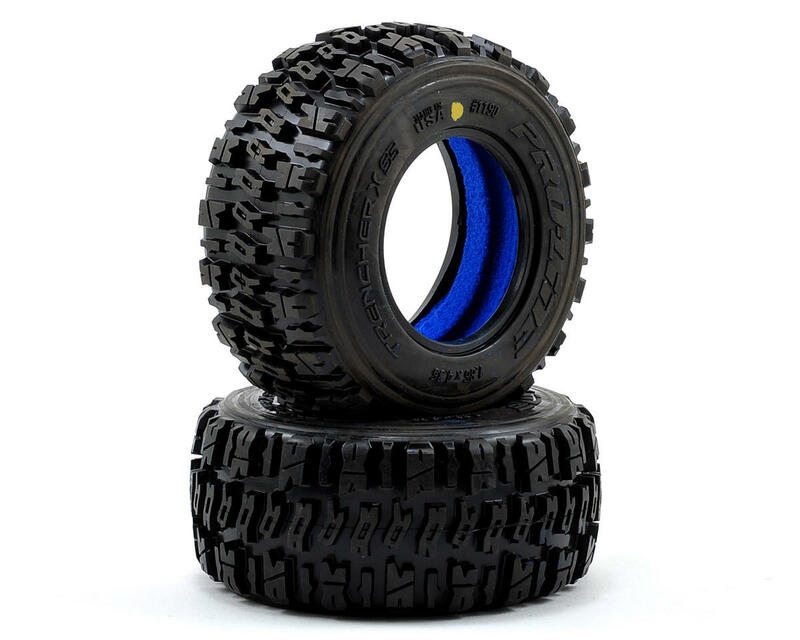 After using these tires for about a month with a stock slash 4x4 with a 2s lipo and on various surfaces, gravel, dirt, grass, asphalt, sand, mud and pretty much everything I can throw at them I found they have great forward traction and have started stretching my axles, halfshafts and diff yokes. All I had to do was adjust my slipper clutch and problem solved but it goes to show that these tires have awsome bite. Only downfall or something that ppl who get these tires in the m3 compound will need to monitor your throttle control on roads or you can wear the tires down very fast. I did a few reverse donuts and it wore the tires down a litte but they still have plenty tread life. 5stars!!! I got these for the rear axle on my Slash 2WD. I run mostly on my backyard track which is part loamy top soil and part concrete. The tires had a surprising amount of traction on the concrete which made it easy to traction role if I went into to the corner too hot. On the dirt the tires had decent bite, they're a huge improvement over the stock Traxxas tires, but they still spun and ballooned out on loose material. I would recommend to anyone looking for an all terrain tire.